Why don't stock levels match my store? There are a few reasons that inventory or stock levels showing in Inventory Planner could be different than what shows in your store or inventory management system. Inventory Planner syncs automatically once daily. If there were sales after this time, there could be small discrepancies between IP and your store. The sync time and date are visible at the top of your screen. 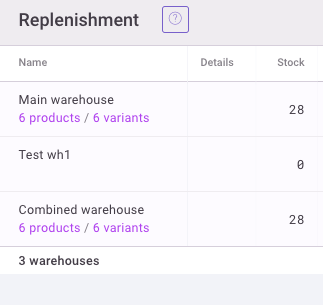 If you manage multiple warehouses, check to make sure you're comparing the same warehouse (or combination warehouse). View your current warehouse at the top of your screen. When viewing all warehouses, you can see stock by individual and combined warehouses.